As much as I love simple, basic hammocks, it is amazing to see the innovations and creativity taken to push hammocks even further. The Hammock Tent 90° Gamma UL is what I refer to as a “hybrid” hammock, that merges different concepts into a new approach to hanging. *The dimensions of this hammock are measured from the pad sleeve. The hammock itself has a ridgeline length of 84 in (213 cm) and a total height/drop/depth distance of approximately 51 in (130 cm). Note that this can change if you shorten the adjustable ridgeline. The Hammock Tent 90° Gamma UL Hammock is very similar to the EXPED Ergo Hammock Combi and the Amok Draumr. The basic design concept really goes back to the traditional Mayan and Brazilian hammocks that are large enough and hung deep enough to allow you to sleep at near 90° from the axis for a comfortably flat lay. The hammock has been engineered to reduce fabric and weight by replacing much of the hammock with string nettles. This not only reduces the weight and bulk, but also improves the views across the hammock. 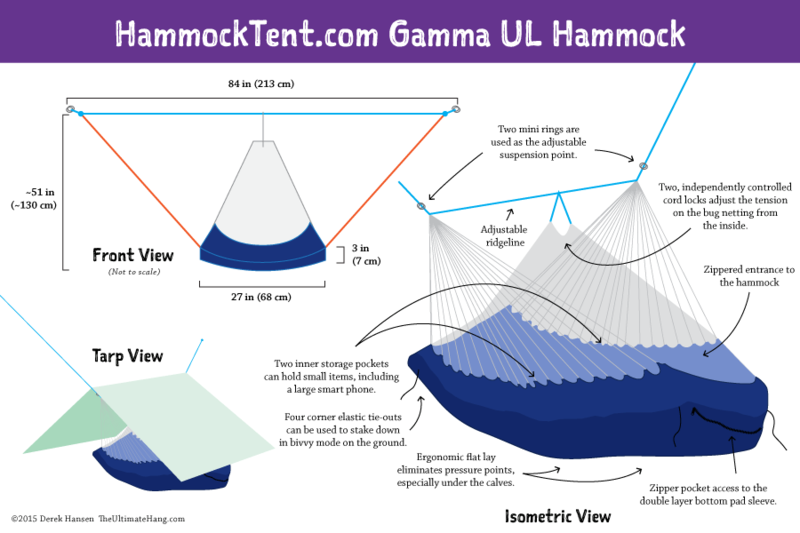 I was sent the Hammock Tent 90° Gamma UL Hammock as a research sample, with no obligation for a review. 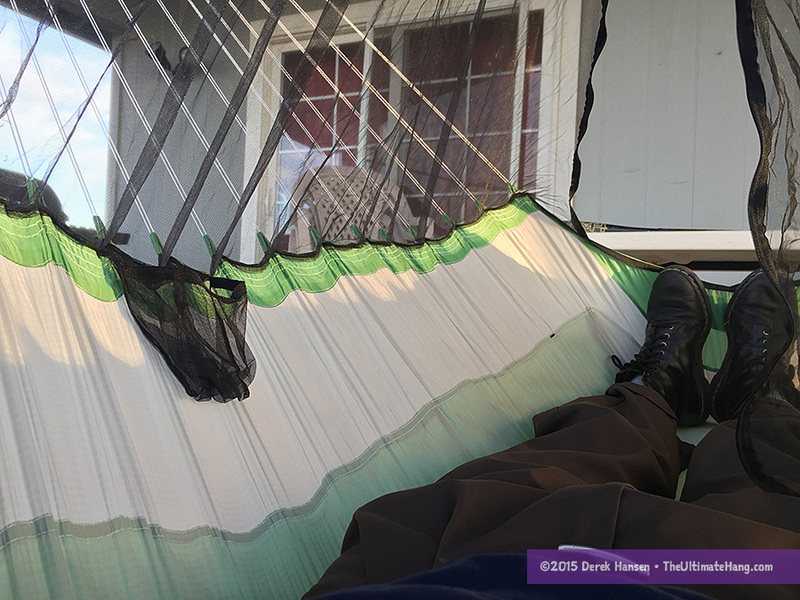 I’ve considered posting a review on this hammock for months, considering how best to write about it. It truly is a very unique and interesting approach to hammock camping. What is also amazing to me is how light they have made this hammock. Usually, hammock designs that veer away from the simple gathered-end approach suffer from “feature bloat” or material requirements that can add significant weight to the kit. The Gamma UL is surprisingly lightweight, yet is fully featured with a zippered bug net, pad sleeve, and a unique 90° sleep angle. When I first reviewed the Amok Draumr, I bemoaned the fact that the hammock required a sleeping pad in order to form the hammock. Without the pad, the Draumr was unusable. The Gamma UL, in contrast, is designed with full support without using a pad. I’ll admit that the Gamma UL is more comfortable and roomier to me with a pad, but that is somewhat subjective, as it is a comfortable and usable design as is. The pad eliminates some shoulder squeeze and provides a fuller, flatter lay. I first used a thinner self-inflating pad, which worked very well, but it didn’t fill the sleeve as well and I could feel some heat loss along my legs. Larger, thicker pads fill the sleeve better. The hammock can also be used with under quilts with the right rigging. While the overall design of this hammock is novel and well-crafted, I was truly impressed with all the little details. One that sticks out to me is how the designer tackled the nettles. The nettles are the strings or ropes that help form a hammock and have been used with hammocks for centuries. The original woven Mayan hammocks use nettles to complete the hammock and are half the total width of the hammock. Nettles are also used on Navy hammocks and can be adjusted to vary the overall length of a hammock, allowing for a lot of customization and modularization on a hammock. One major problem with nettles is that they easily get tangled, especially if the nettles are made from thin line. Hammock Tent.com has solved this issue by designing sleeves that cover the nettles when packed and stored. Buttons snap the sleeves in both deployed and open positions. It’s a fantastic design. Getting into a 90° hammock takes a little getting used to. 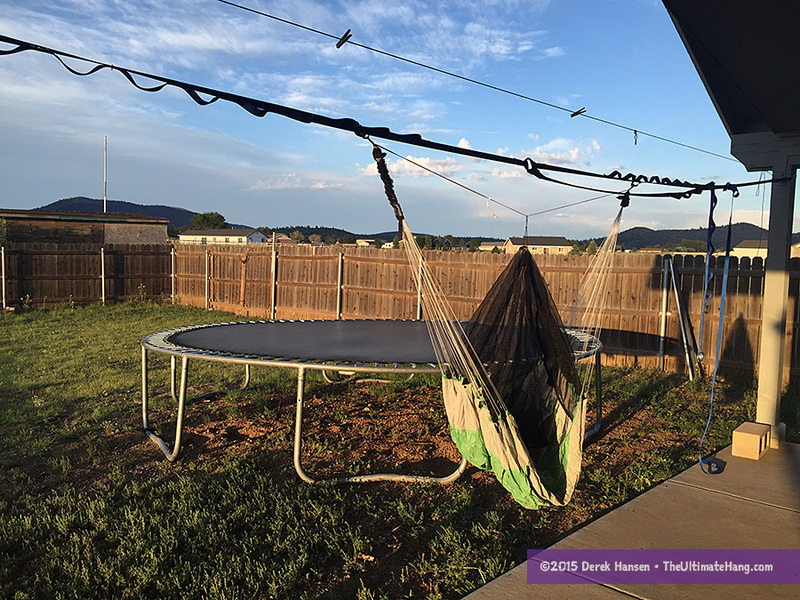 Since the hammocks is engineered to “force” a transversal lay, the fabric is bunched up in a way that makes it a little difficult at first to enter. Like a gathered-end hammock, you should sit in the center, and then pull the fabric out on the head and foot end to enter. Minor shifting is required to straighten everything out. Using a pad helps make this process a little easier since the fabric is stretched open. The suspension system on the Gamma UL uses a double ring. This can be used with a Garda hitch or a webbing strap, or you could replace the stock suspension and use other after market systems. Another advantage of this hammock design, like the Amok and EXPED models, is that they require less room to hang than common gathered-end hammocks. This means there are more places to hang. You can also adjust the ridgeline, and get into even tighter spaces. The downside of the design is how to cover it for rain protection. Most hammock designs use a simple A-frame tarp shape to cover a hammock. This works well for most gathered-end designs because you generally lay down the ridgeline of the tarp so you have plenty of head room. A transversed hammock, like the Gamma, puts your head and feet near the side panels of the tarp as they slopes down. This can cause some condensation issues in some conditions, as well as headroom issues when you lay down. Pitching the tarp higher helps alleviate these issues, but it also opens the sides for wind shearing and precipitation. This hammock has all the fit and finish of a high-end commercial product, but has the feel and love of a cottage vendor. All the stitching is straight and even with no stray fibers. There is a superior attention to detail, with well-thought-out improvements that are simply brilliant. While this hammock can be used with any conventional tarp, there’s a specifically designed tarp-tent available on the product website which offers very good protection even from heavy weather conditions, much like a traditional tent does. Go and take a look at http://www.hammocktent.com/en/products/tarps. The amok is a little roomier and it is nice as a complete kit. It has some nice features like chair mode and the storage pockets. It can be a little tricky to enter at times. The 90° is very light and is great if you backpack where every gram is counted and storage a premium. It’s nice that you don’t need a pad for structure but a pad does add comfort and shape inside. Did you try out the fly that hammocktent makes? It seems to give better side coverage (and privacy) than the stock Amok fly. Do you think that the hammocktent fly would fit the Amok Draumr? No, I haven’t tried the tarp but I agree with your assessment. I think it would fit the Draumr. Does the hammock work better with different styles of pads( horizontal vs vertical tube structure)? Yes. Only use the ones recommended by Amok. I’m 6′ 2″, 250lbs of manly awesomeness. Will this hammock comfortably contain my substantial girth? You might be on the edge for your height. Always check the weight rating / capacity of the hammock and make sure you feel confident in your choice.